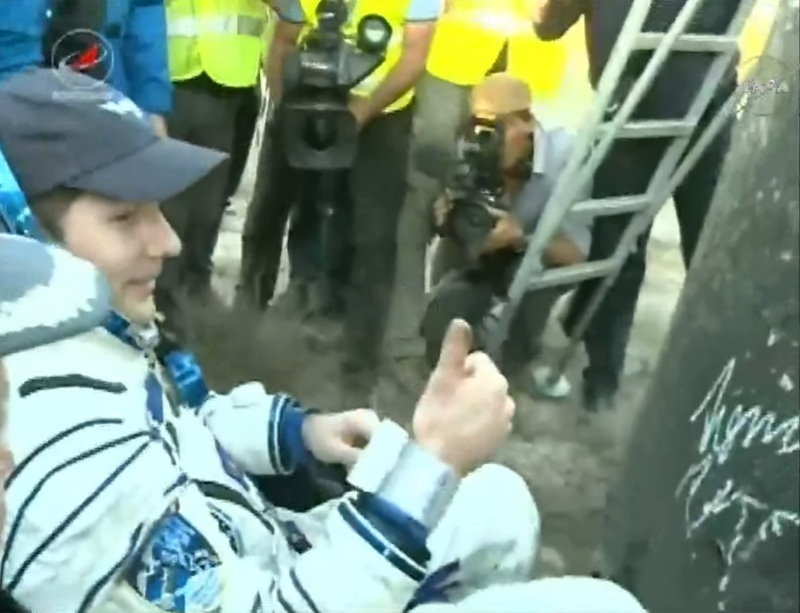 Two-time Soyuz Commander Oleg Novitskiy and ESA Astronaut Thomas Pesquet enjoyed a flawless homecoming aboard their Soyuz MS-03 spacecraft, culminating with the usual bumpy parachute-and-rocket-assisted landing at 14:10 UTC, 8:10 p.m. Kazakhstan time, just 60 minutes before sundown over the sparsely populated landing area 147 Kilometers from the remote town of Dzhezkazgan. The two Soyuz crew members – gearing up for the first two-person Soyuz landing since 2010 – boarded their spacecraft at 7:31 UTC Friday morning and set sail on their return journey at 10:47 UTC when Soyuz MS-03 undocked from the Station’s Rassvet module and fired up its thrusters to open up a gap before igniting the craft’s main engine for the precisely planned deorbit burn. 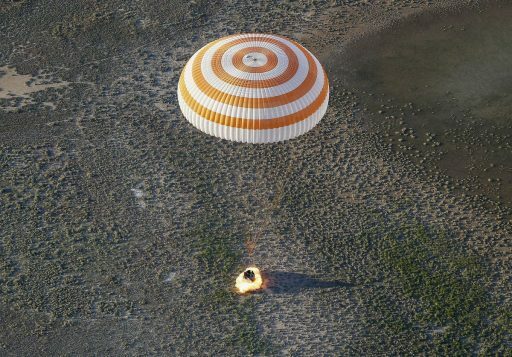 Barreling toward their landing site in a blaze of hot plasma, Soyuz slowed below the speed of sound for the deployment of the large orange-and-white parachute for a ten-minute vertical descent to the ground and a quick blast from six Soft Landing Engines to cushion the crew’s return to Terra Firma. 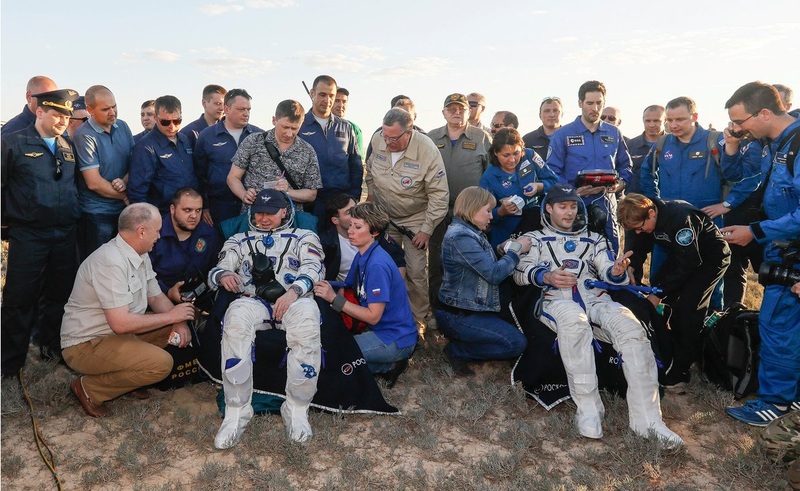 Ground crews rushed to the landed capsule in helicopters and all-terrain vehicles, quickly helping the crew members out of the Soyuz, both appearing to be in good health and excellent spirits after a half-year stay off the planet. 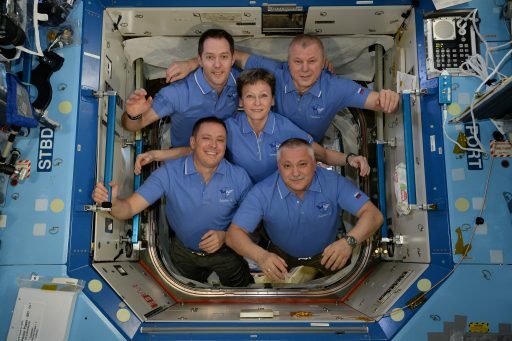 Launching back on November 17, 2016 in a cold winter night at the Baikonur Cosmodrome as a crew of three, Novitskiy, Pesquet and NASA’s Peggy Whitson embarked on a two-day link-up with ISS before trading the confined space of the Soyuz with the comforts of the Station. Their mission was to become a very fast-paced Expedition covering scientific experiments aboard the orbiting laboratory, a series of planned and unplanned spacewalks, visiting vehicle arrivals and departures and extensive robotic operations on the outside of the complex. The majority of the crew’s time on ISS was spent with science, supporting close to 250 active experiments ongoing in the various laboratory modules of the Space Station and covering virtually all scientific branches with the crew oftentimes acting as experiment subjects themselves, exploring the effects prolonged spaceflight has on the human body and mind. A major task of the crew’s mission in December and January was an upgrade of the Station’s batteries via six new batteries flown up to the Station by the Japanese HTV-6 spacecraft that replaced a dozen aging batteries on the starboard truss segment – an operation that required an elaborate robotic-and-human collaboration comprising two weeks of robotic work plus two EVAs by the crew. HTV-6 departed in early February, but ISS did not have to wait long for its next visitors as the SpaceX Dragon SpX-10 craft and Russia’s Progress MS-05 were inbound within a day of one another later in February, making for busy cargo transfer operations on both segments of ISS. Another major task for the Expedition 50 crew came in late March when it was time to move Pressurized Mating Adapter 3 from Node 3 to Node 2 where it will be available as a docking module for upcoming Commercial Crew missions to ISS. 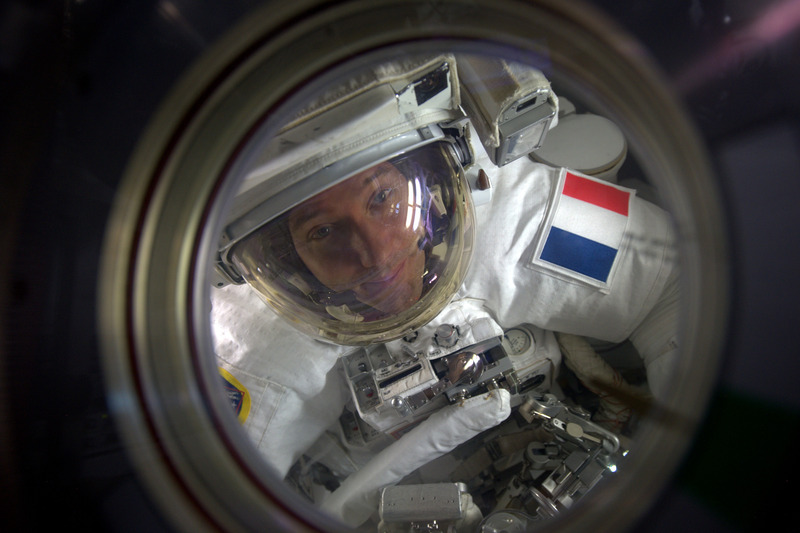 Although the move of PMA-3 was completed robotically, spacewalks were needed before and after the module’s relocation to deal with electrical connections. Three Soyuz MS-03 crew members turned into a two-person crew when Peggy Whitson agreed to extend her stint by three months, switching to the MS-04 crew of Fyodor Yurchikhin and Jack Fischer by taking advantage of an empty seat aboard their spacecraft that was the result of Russia scaling down its permanent ISS crew to two members. 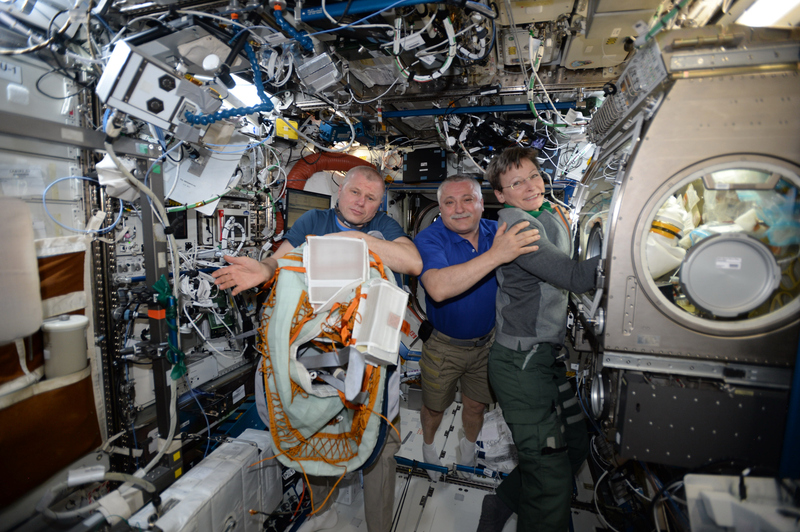 Keeping Whitson on ISS avoids a lengthy period of two-crew operations and enables ISS to keep up with an ambitious science schedule planned for Expedition 52 over the summer. The two departing crew members left ISS in the capable hands of Expedition 52 Commander Yurchikhin and Flight Engineers Whitson and Fischer as they bid farewell and boarded their Soyuz spacecraft after an early wake-up time on Friday to enter their day-long return to Earth. Soyuz was sealed off by closing hatches on the spacecraft and the Rassvet module – marking the start of a two-hour process for the crew to check for leaks, configure their Soyuz for undocking and put on the Sokol Launch and Entry Suits – their last line of protection in case of a depressurization on the way down. 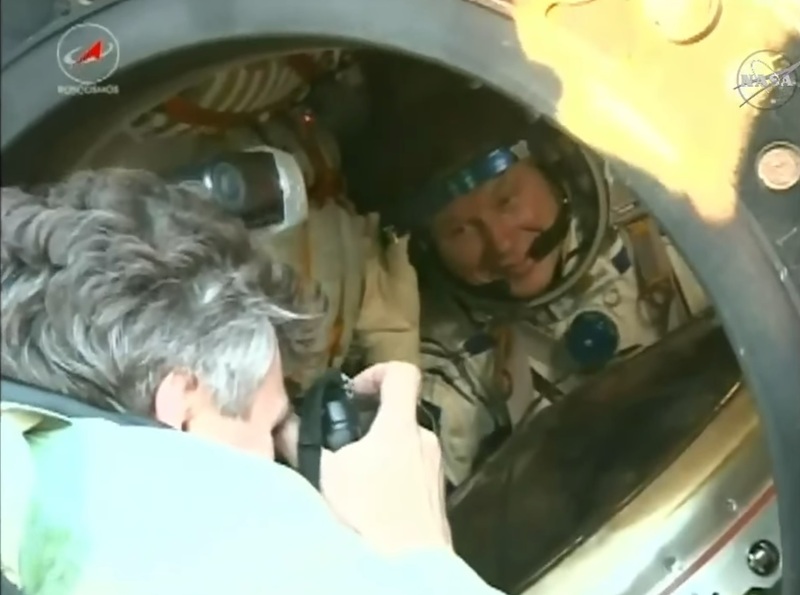 Quarters inside the Soyuz Entry Module were not as cramped as usual – second-time commander Novitskiy boarded the center seat with Pesquet to his left and the right seat occupied by additional return cargo substituting the third crew member. 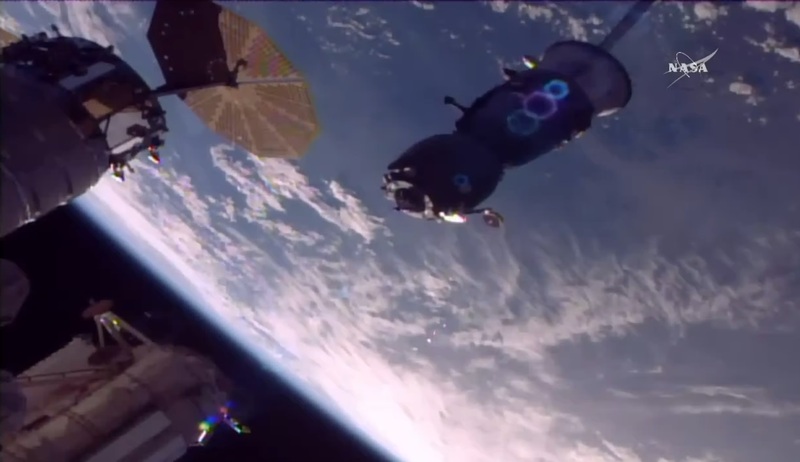 Hooks started driving open at 10:45:30 UTC to demate the seven-metric-ton Soyuz craft from the Rassvet docking port to allow loaded springs to push the spacecraft away 90 seconds later, flying 400 Kilometers above the border of Mongolia and China. Soyuz drifted away from the orbital complex for three minutes ahead of firing its DPO thrusters, first for eight seconds to accelerate the radial departure by 0.54m/s and then for half a minute to set Soyuz on a course away from the Station along the velocity vector with a 1.23m/s delta-v. Beginning to open up a gap of 12 Kilometers, the Soyuz and its crew circled the Earth one full lap before beginning the multi-step process of returning from orbit. Having re-oriented to a tail-first attitude, Soyuz fired up its SKD main propulsion system at 13:17:09 UTC to hit the brakes and place the spacecraft onto a sub-orbital arc intersecting Earth’s atmosphere at a precisely calculated location. The 300-Kilogram-force S5.80 main engine fired for four minutes and 36.3 seconds, slowing the Soyuz by 128 meters per second which is just enough to drop the craft out of orbit. Free falling toward the atmosphere, Soyuz began its final approach to the landing site from south-west to north-east, finishing a last pass over the Atlantic and the African continent ahead of a shallow dive into the atmosphere at a re-entry angle of 1.35 degrees. Dropping in altitude, Soyuz accelerated again to a speed of 7.6 Kilometers per second and the crew closed their helmets to be ready for the separation of the modules. A series of bangs shook the spacecraft when pyrotechnics fired in very close succession to separate the Entry Module from the Service and Orbital Modules that were headed for destruction on re-entry. Module separation – confirmed by a ground station in Egypt – occurred 140 Kilometers over the Red Sea. Immediately after separation, the small 2.24 by 2.17-meter Entry Module fired up its Hydrogen Peroxide-fueled thrusters to orient to the correct posture for re-entry – hitting Earth’s atmosphere at 13:47:25 UTC near the border of Iraq and Iran. Soyuz held a pre-programmed attitude for the first minute and a half followed by the initiation of active entry guidance taking the capsule through bank maneuvers to dissipate energy and modifying lift to control the along-track travel distance. 80 Kilometers above the Caspian Sea, Soyuz entered the plasma blackout where the hot ionized plasma layer around the craft prevents any communications with the crew. Enduring temperatures of 1,600°C, the craft’s heat shield slowly burned away as it is designed to do in order to create a gaseous boundary between the Soyuz and extremely hot layer of compressed air in front of the capsule traveling at hypersonic speed. Rapidly decelerating, Soyuz and its crew pulled a maximum of 4Gs and the spacecraft actively modified its trajectory to arrive at a pre-determined parachute deployment position. Re-acquiring communications with the ground, Oleg Novitskiy reported both crew members were feeling well after passing Max G load and all was in order aboard the spacecraft as wind noise became audible and Soyuz went through the trans-sonic region. Passing through 10.8 Kilometers, Soyuz blew its parachute cover and mortars ejected two Pilot Chutes that, upon inflation, pulled out the Drogue Chute – a sequence occurring while Soyuz traveled 0.7 times the speed of sound. For the crew, parachute deployment is one of the most violent events as Soyuz gyrates rapidly under the chute for about half a minute before its descent stabilizes. 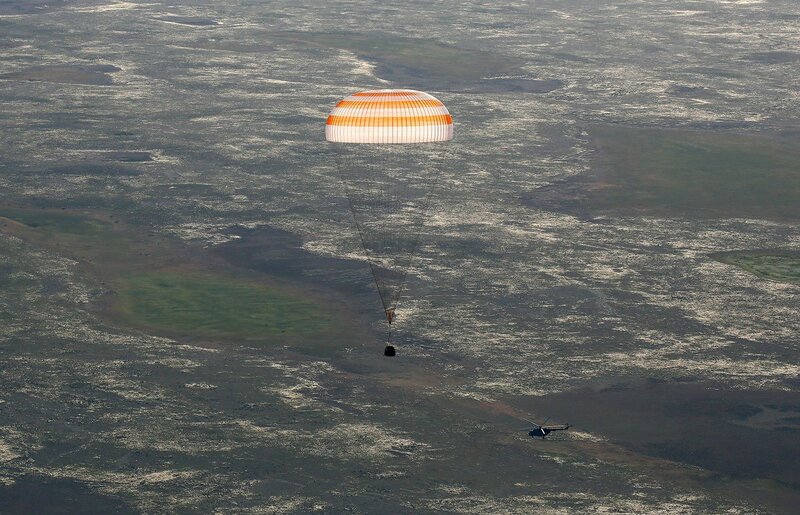 Clear skies at the landing site allowed the recovery team to track the incoming Soyuz for a large portion of the descent under its chute. The Main Chute deployed around 7.5 Kilometers in altitude and Soyuz initiated its landing program – dropping the heat shield, venting its propellant tanks and equalizing the cabin pressure before lifting the crew seats up for shock-absorbing purposes upon landing. Soyuz used its gamma-ray altimeter to judge when touchdown was imminent to blast the solid-fueled Soft Landing Engines just a few meters above the ground to cushion the landing. 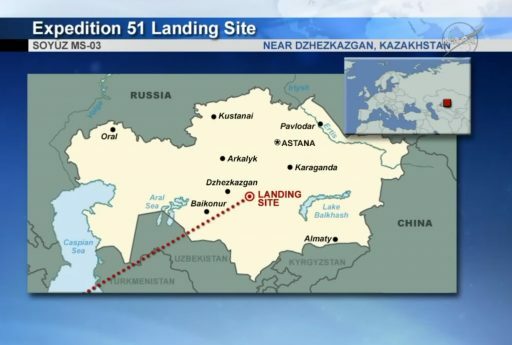 Touchdown was marked at 14:10 UTC in the planned landing zone 147 Kilometers south east of Dzhezkazgan – capping a flight of 196 days, 17 hours and 53 minutes. 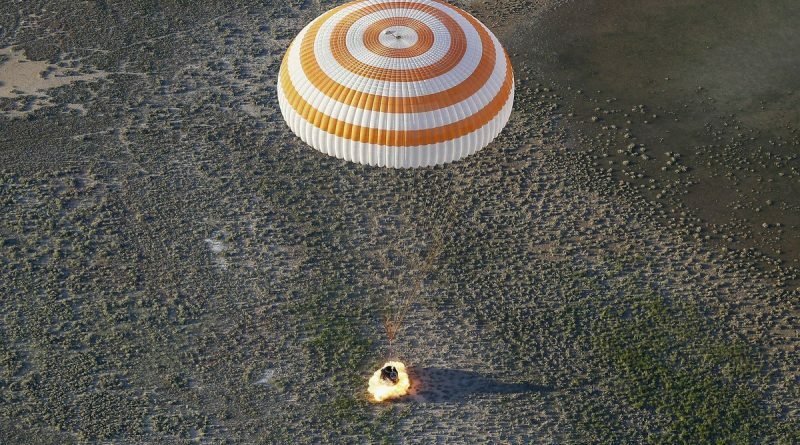 Meeting Terra Firma, by some likened to a small car crash, Soyuz came to rest on its side and the crew remained in their seats while recovery forces in ground-based vehicles and helicopters descended on the landing site. The experienced recovery team was extremely quick in getting to the Soyuz, rigging up equipment for crew extraction and opening up its hatch to begin helping the crew out of the small capsule in time for them to see their first sunset from the ground after experiencing over 3,000 while on ISS. First out of the Soyuz was Commander Oleg Novitskiy who has now logged 340 days in space as part of long-duration missions to ISS for Expedition 33/34 in 2012/13 and Expedition 50/51, earning him a spot in the Top 50 space travelers for career time spent in space. Thomas Pesquet’s Proxima mission was his first flight to space, now with 196 days logged off the planet as well as two spacewalks for a total of 12 hours and 32 minutes. Both crew members appeared in excellent physical condition after their return from orbit, enjoying a breath of fresh air in reclining chairs set up next to their Soyuz before moving into the nearby Medical Tent for post-landing exams. 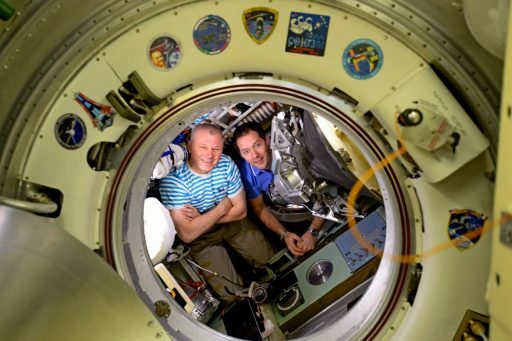 They will fly back to the staging city of Karaganda for a short welcoming ceremony before the duo will split up as Oleg Novitskiy heads back to Moscow and Thomas Pesquet flies directly to ESA’s Astronaut Center in Cologne, Germany. ISS is looking at very busy days ahead, gearing up for the departure of the Cygnus OA-7 cargo craft on Sunday after a stay of six weeks – being sent off on a week-long free flight for an in-space fire experiment and the deployment of CubeSats. On Monday, ISS expects to welcome the Dragon SpX-11 spacecraft provided weather at Florida’s Space Coast cooperates on Saturday for the launch of the mission atop a SpaceX Falcon 9. Next up after Dragon will be the Progress MS-06 cargo mission, targeting launch from the Baikonur Cosmodrome on June 14th. 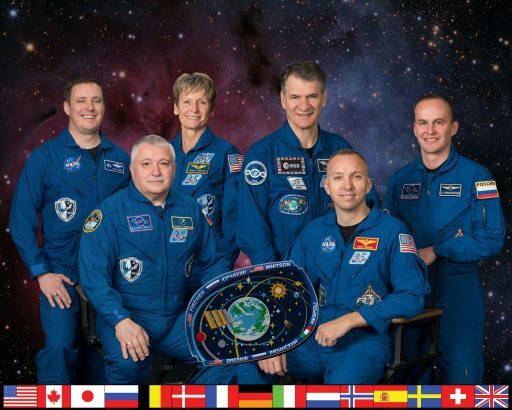 These visiting vehicle operations will be handled by the three-person Expedition 52 crew as they await the arrival of their colleagues Sergei Ryazansky, Randy Bresnik and Paolo Nespoli, launching aboard Soyuz MS-06 in late July.